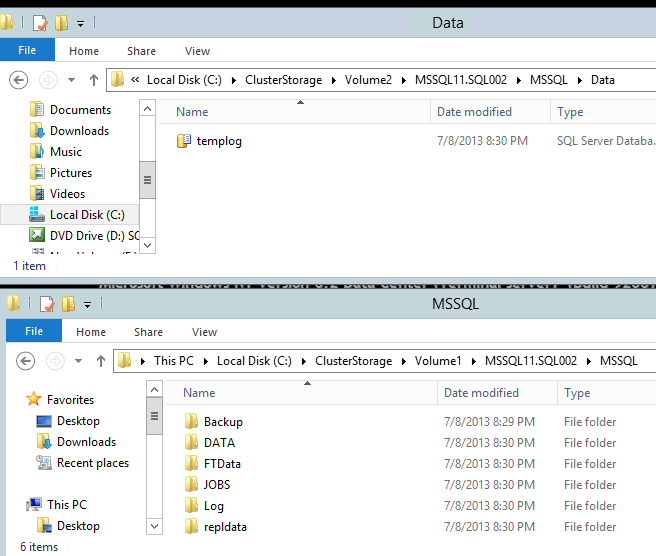 As there are a lot of extra options to extend your SQL server and give your DB the HA feeling. I hope the next post will give you insight in a how to get there. 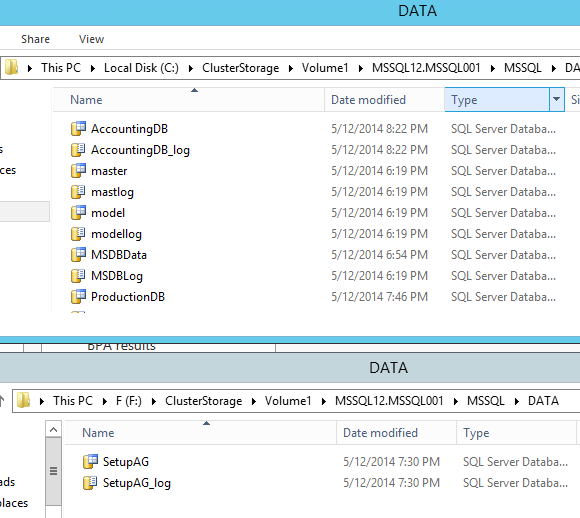 In a follow up post I will explain the Azure and extra options of SQL Server 2014. The AlwaysOn Availability Groups feature is a high-availability and disaster recovery solution that provides an enterprise level alternative to database mirroring. An availability group supports a failover environment for a discrete set of user databases, known as availability databases, that fail over together. An availability group supports a set of read-write primary databases and one to four sets of corresponding secondary databases. Deploying AlwaysOn Availability Groups requires a Windows Server Failover Cluster. To be enabled for AlwaysOn Availability Groups, an instance of SQL Server must reside on a Windows Server Failover Cluster node, and the Windows Server Failover Cluster and node must be online. 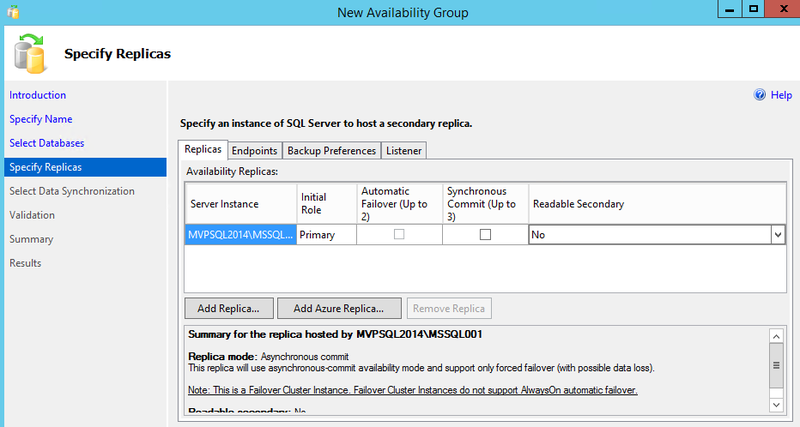 Furthermore, each availability replica of a given availability group must reside on a different node of the same Windows Server Failover Cluster. 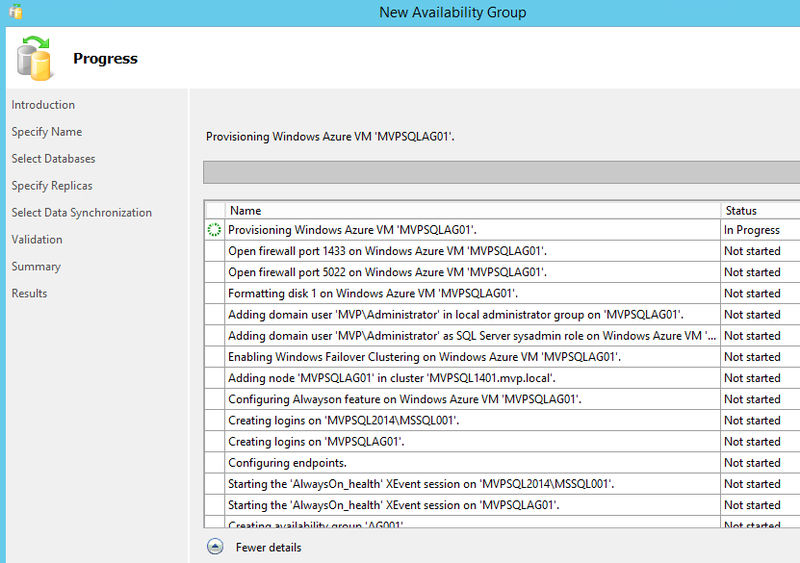 AlwaysOn Availability Groups supports cross-cluster migration of availability groups for deployments to a new Windows Server Failover Clustering. A cross-cluster migration moves one availability group or a batch of availability groups to the new, destination WSFC cluster with minimal downtime. By implementing AlwaysOn SQL Server FCI an availability replica can be hosted by either a standalone instance of SQL Server or an FCI instance. 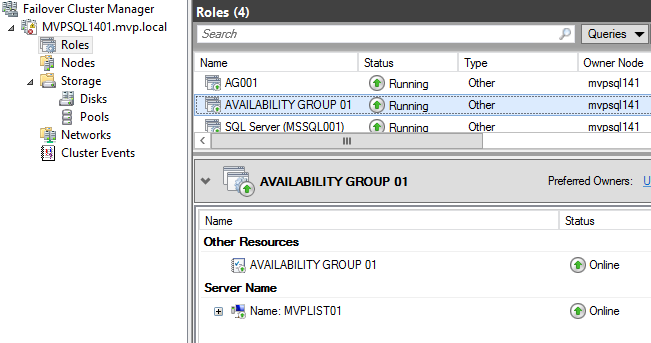 Only one FCI partner can host a replica for a given availability group. 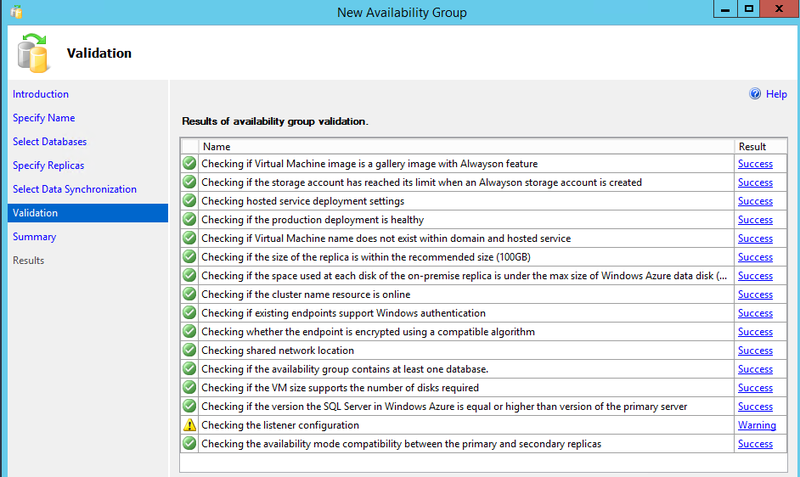 AlwaysOn Availability Groups does not depend on any form of shared storage. 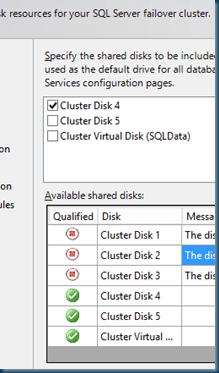 However, if you use a SQL Server failover cluster instance (FCI) to host one or more availability replicas, each of those FCIs will require shared storage as per standard SQL Server failover cluster instance installation. You might need to configure a Windows Server Failover Clustering (WSFC) cluster to include shared disks that are not available on all nodes. For example, consider a WSFC cluster across two data centers with three nodes. 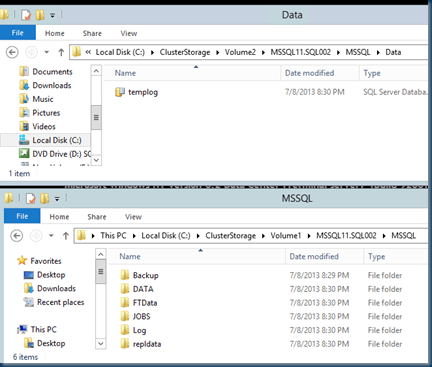 Two of the nodes host a SQL Server failover clustering instance (FCI) in the primary data center and have access to the same shared disks. 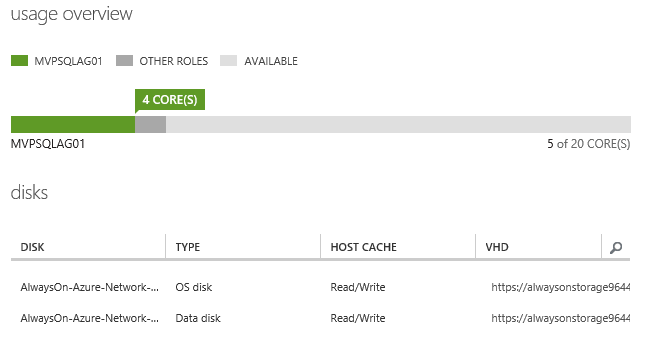 The third node hosts a stand-alone instance of SQL Server in a different data center and does not have access to the shared disks from the primary data center. 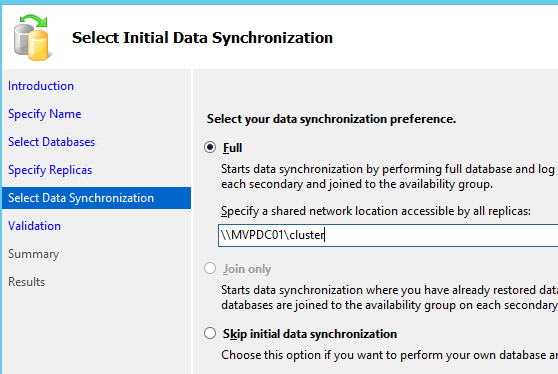 This WSFC cluster configuration supports the deployment of an availability group if the FCI hosts the primary replica and the stand-alone instance hosts the secondary replica. 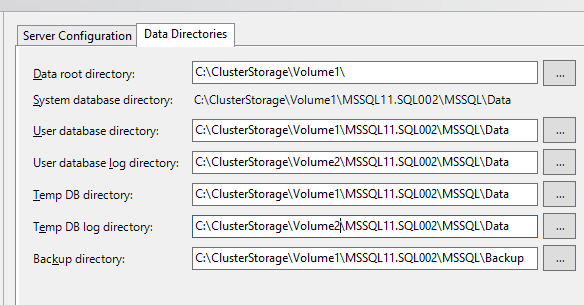 I already had my cluster in place with the SQL AlwaysOn FCI and I have also installed a Second Cluster and a Second Instance on the cluster and already extended the SQL site to Azure and with several standalone server. Before we start we need to enable the AlwaysOn HA option in on the server this is only done on the running server and is cluster aware. One setting for all the nodes for the same instance! When we tried to enable the AG it is grayed out. in the SQL management. When you are connecting to the passive node on the cluster you will see this, on a standalone install you can only connect to the active node. I just created a dummy DB just to set this up and I will later Add the real DB. The dummy DB needs to have a full Backup ! So If your DB is as large as a TB a full backup is needed. This is a interesting Screen Lots of Options and also Connections To Azure. First we do a on premise connection and build a Replica to Azure. and make a choice “ add Replica “ When we select the add replica a SQL login screen will popup. 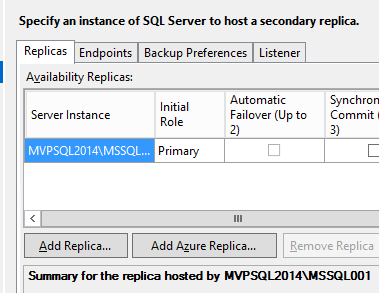 Remenber you need to connect to the replica SQL server. This server is my standalone instance but installed on a failover cluster. All the cluster nodes must be in the same Active Directory Domain Services (AD DS) domain. 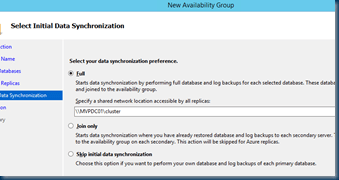 Each availability replica in an availability group must reside on a different node of the same Windows Server Failover Clustering (WSFC) cluster. Have a domain account in the domain where the cluster will exist. 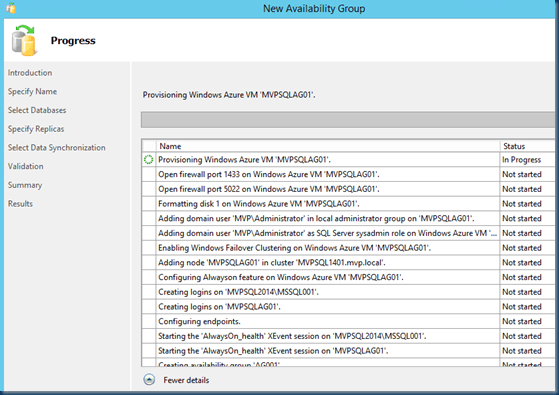 Have local administrator permissions on each cluster node. Have Create Computer objects and Read All Properties permissions in AD DS. For more information, see Failover Cluster Step-by-Step Guide: Configuring Accounts in Active Directory. The Chosen Server is selected and added to secondary. In a cluster there is no automatically failover! In the secondary role, this availability replica will not allow any connections. I’ll use this pure as a backup and no changes will be made in the backup location. If the cluster is failing I have more problems than a not working Application. All the options can be set but If you have multiple instances (AlwaysOn FCI ) and installed a local standalone Instance You may need to change the Endpoint Port! the default is 5022. I changed the port to 5023 just to make sure that there is no problem on my server. Changing the port is easy “ SELECT * FROM sys.tcp_endpoints “ will show you the ports. With “ ALTER ENDPOINT [hadr_endpoint] AS TCP (listener_port = 5023) “ you change the port to a better one. 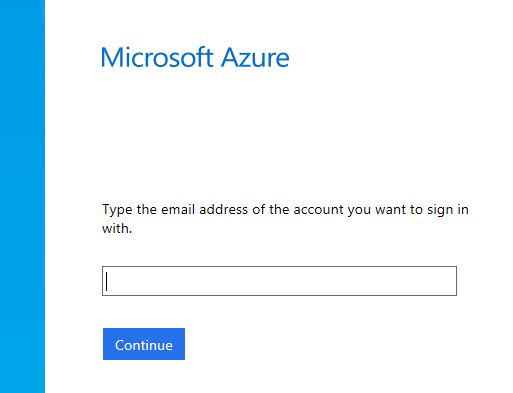 Normally If you run this wizard and doing this steps you are fine, but in my demo site I had already a connection to Azure and therefor my listener want not only a local IP but also an Azure IP as described in the error message. 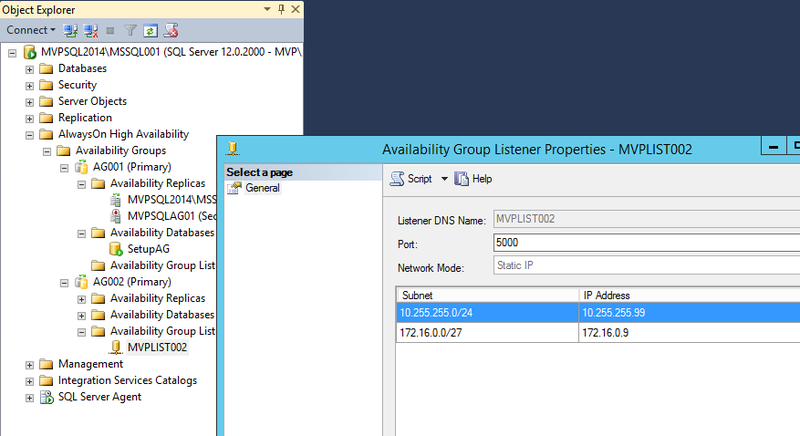 As you could see I needed to add a second IP for my listener that is I already setup a failover to azure. 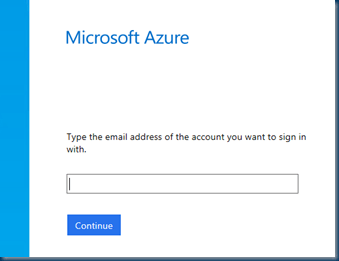 And I dis the Azure Replica and If you are not already connected and added the thumbprint to your SQL server then you need to do this. a quick connection screen will popup and does fill in your subscriptions. If you have multiple just pick the right one. So after connecting and downloading you will have the following. Reminder there is only creating NEW VM available ! 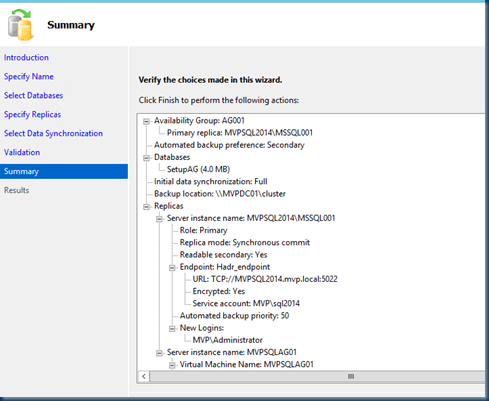 If you want to use an existing VM then use the add replica just as in a normal situation. 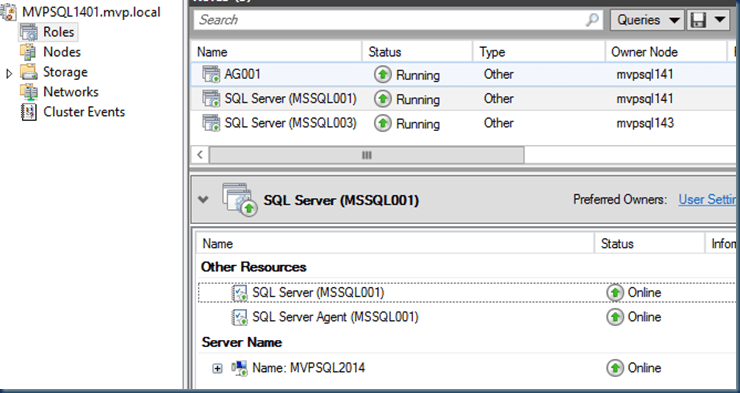 The bad thing is here you can not pick a SQL server that already is build. But in the Screenshots you will see this is much easier. But it would be nice to tweak this a bit. It Would be handy if you could also pick an existing VM. After filling in my name and version Size We can go to the next step. keep in mind you can always lower the size of the VM but now it is faster and the setup process will be quicker. 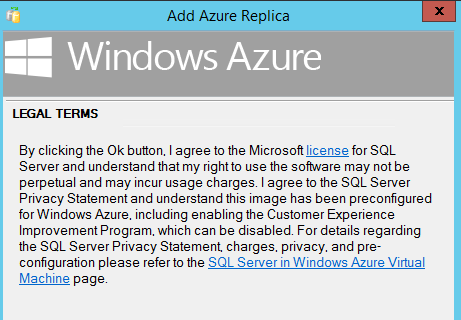 As you can see the Azure Replica server is added. 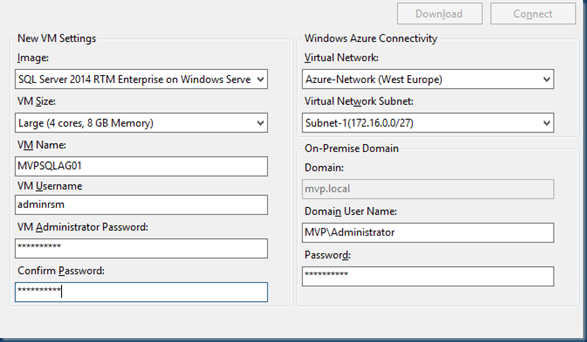 As I connected the Azure SQL with a Azure Gateway to my LAB environment we can share files thru the domain. The wizard kick in and we have to wait until it is done. I did not create a listener for this, I just want to replicate the data to Azure. The progress screen an this can take a while. With a quick peek in Azure We can see this. This is a Critical Point I have done this now several times and sometimes it fails in a time out , and I found out that I used most of the time a small server and then the script will fail with “Error” so a quick tip use the default size and adjust this after the creation. As you can see there are multiple disks and the Wizard has run successfully. 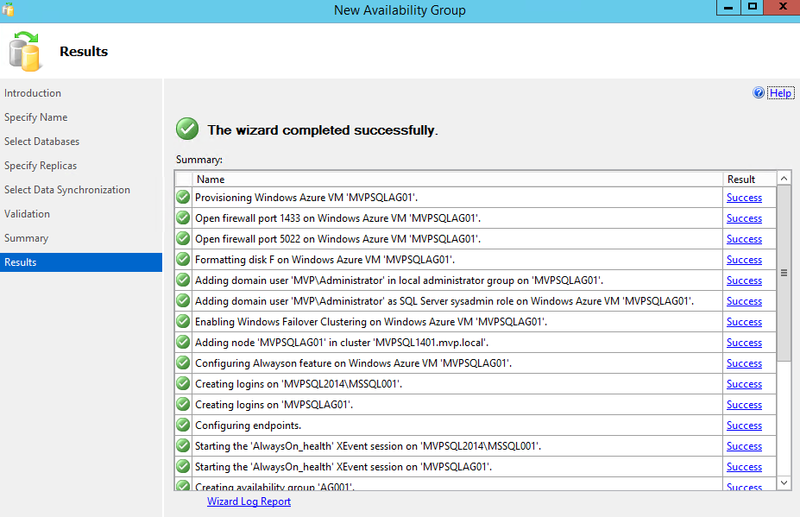 and this path is available for every cluster node and therefore also in the Azure cloud. and the “ normal” wizard tells me he the DB is already there. but now this step is skipped. 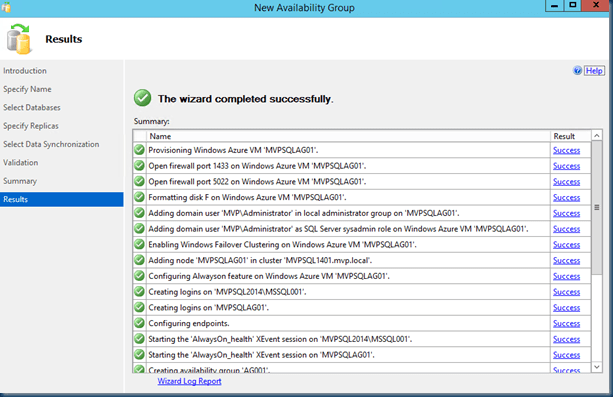 Now that the wizard is done and a lot of scripting is passed the line to azure. But what is changed and does it work ? The replica is created and as shown in the dashboard replicated. The Following Issue can happen when you use CSV and or you want to create a replica from FCI to FCI. The reason is the disk letter need to be the same on source and destination, as the CSV volume is mounted to every node and therefor the DB is already there and the setup will fail. 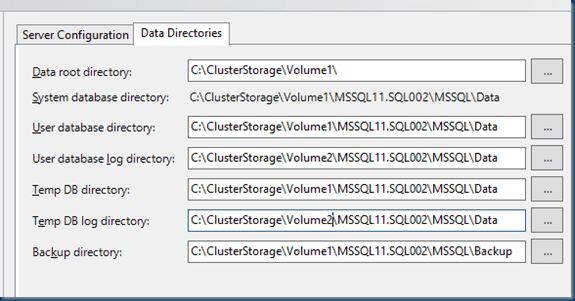 Right I use CSV but is the CSV replicated to Azure Yes the cluster does this! But there is no disk mounted in azure and all the files will be placed on the c drive! and the replica can not be created on the location because the source DB is there. If you create the replica by hand you can do this but not by default with the wizard. just a reminder when you playing with this. 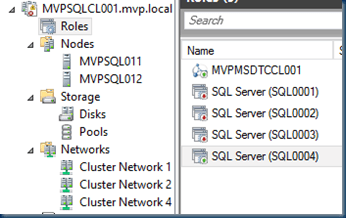 There are some options when you enable AlwaysOn the easiest way is having standalone SQL server running on a cluster node. More advanced is using AlwaysOn FCI. But all this can be done just test everything before you go in production . So that you know how your configuration is working. And just because you can will not say this is your best solution or design. There are many options and will grow are products evolve. 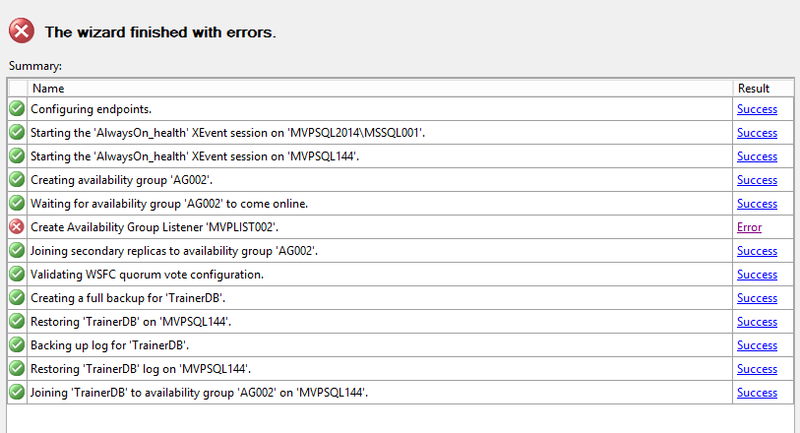 A SQL Server Availability Group enables you to specify a set of databases that you want to fail over together as a single entity. 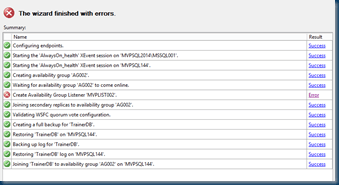 When an availability group fails over to a target instance or target server, all the databases in the group fail over also. 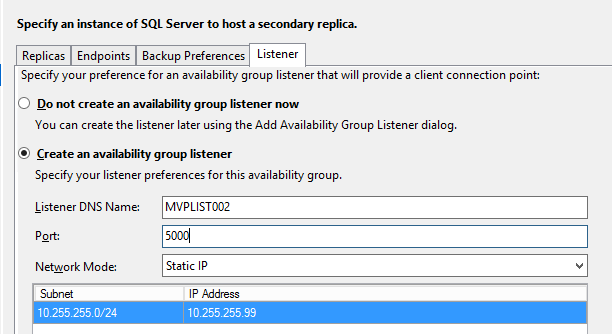 Because SQL Server 2012 can host multiple availability groups on a single server, you can configure AlwaysOn to fail over to SQL Server instances on different servers. This reduces the need to have idle high performance standby servers to handle the full load of the primary server, which is one of the many benefits of using availability groups. Replicas, which are a discrete set of user databases called availability databases that fail over together as a single unit. Every availability group supports one primary replica and up to four secondary replicas. 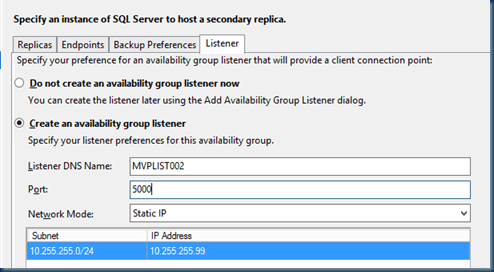 A specific instance of SQL Server to host each replica and to maintain a local copy of each database that belongs to the availability group. 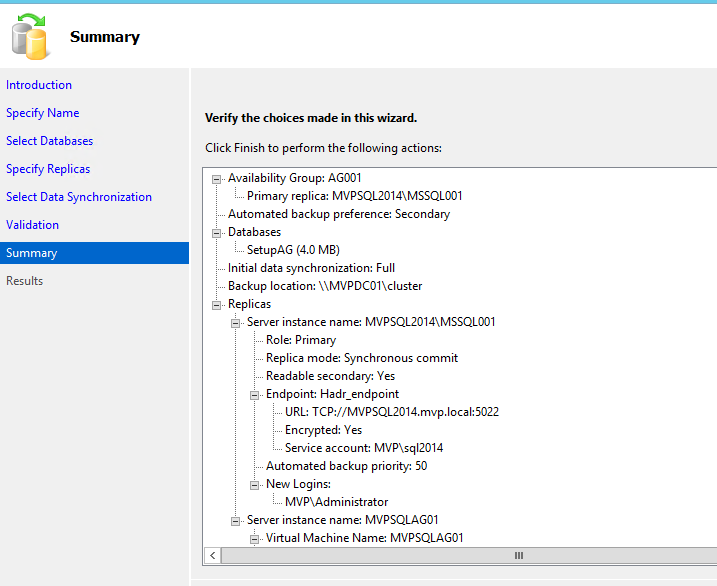 The primary replica makes the availability databases available for read-write connections from clients and sends transaction log records for each primary database to every secondary replica. Each secondary replica applies transaction log records to its secondary databases. All replicas can run under asynchronous-commit mode, or up to three of them can run under synchronous-commit mode. 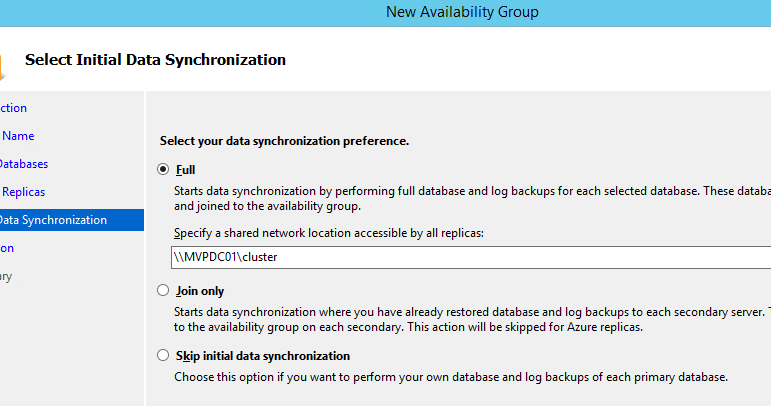 For more information about synchronous and asynchronous commit mode, see Availability Modes (AlwaysOn Availability Groups). Database issues, such as a database becoming suspect due to a loss of a data file, deletion of a database, or corruption of a transaction log do not cause failovers. 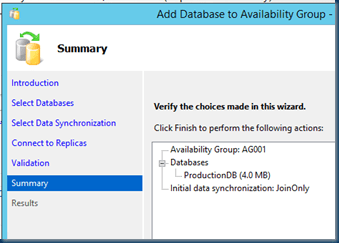 For details about the benefits of AlwaysOn Availability Groups and an overview of AlwaysOn Availability Groups terminology, see AlwaysOn Availability Groups (SQL Server). As described in the other post AlwaysOn Options the First AlwaysOn option is the FCI version. 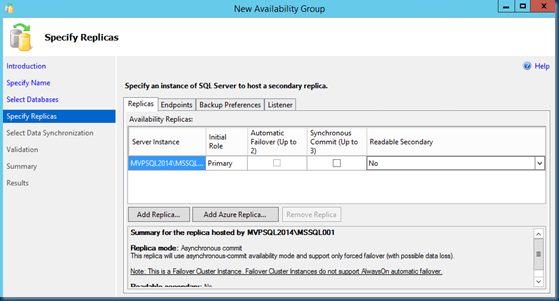 As part of the SQL Server AlwaysOn offering, AlwaysOn Failover Cluster Instances leverages Windows Server Failover Clustering functionality to provide local high availability through redundancy at the server-instance level—a failover cluster instance (FCI). An FCI is a single instance of SQL Server that is installed across Windows Server Failover Clustering nodes and, possibly, across multiple subnets. On the network, an FCI appears to be an instance of SQL Server running on a single computer, but the FCI provides failover from one Windows Server Failover Clustering node to another if the current node becomes unavailable. Now that the Cluster is up and running we can start with the next steps. This Cluster will be the basic of all SQL installations. 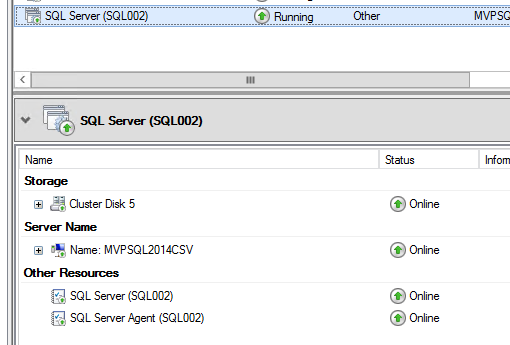 Speaking off SQL Installations I use only 2014 SQL servers and guess what it has new options that I will show you later. 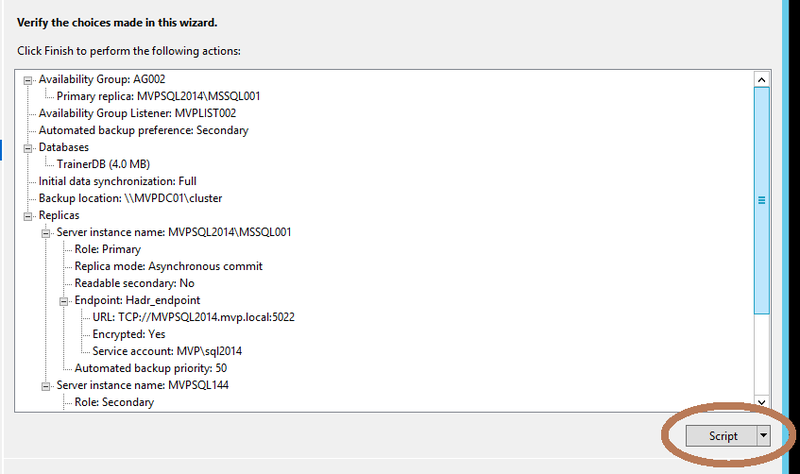 Well now that the cluster is ready we will deploy SQL 2014 ENT to the cluster, everybody can follow a wizard So we do as usual a Command line install based on ini files. This works the best and the result is always the same. 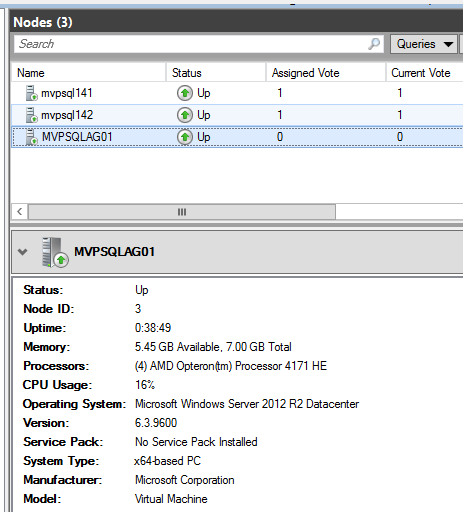 But you can use also VMM or SCCM to do this. And If you want to install this by Gui Fine just remember, I always install in advanced mode If one step is failing I can rerun the second step without the long wait of installing the whole server. Setups are always failing at the end. When running these steps at the end there is a location where the ini file is stored. copy the ini and put it on a save spot. And if you don’t like the interface is showing what the setup is doing then turn this off also. I like to watch so that my boss is thinking I work hard. I mounted the ISO to the Cluster nodes and run this batch file on the first node. As you can see the password is in the file and unencrypted. You can be prompted for this but as this is a how to it is not important right now. After this is done you will have a One node SQL instance. The Second step will be running the step3 script Adding the Second node to the Cluster. And Again I do this by Command line But Did you know there is an option in the setup UI that you can use INI files during the setup ? When using this the setup is not unattended but all the values are used in the ini file. So it is a NEXT NEXT FINISH install this could be handy if you want to change something. Or run the Command line below the join the node to the SQL Instance. 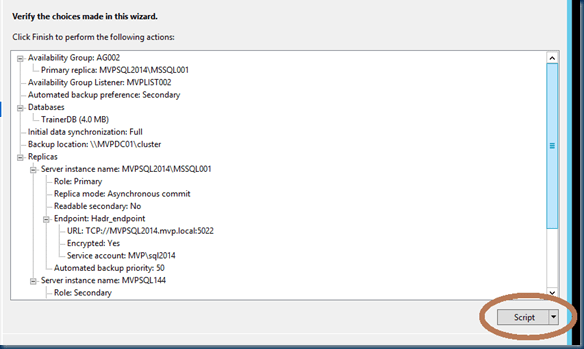 After these steps the SQL AlwaysOn Failover Cluster Instances is ready. If you want to see the installation Steps I created a movie with about the same steps. the whole Process creating and install SQL in just 15 Minutes. not fully untended just for showing you what is possible. 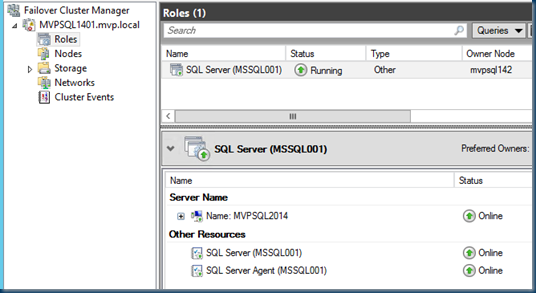 With the new version of SQL server 2014 there are a lot of options possible for DR or some extra Configuration options. In the Old days there was only a failover option in SQL active/passive or if you had multiple instances you could run a instance on every node this could be seen as active/active. en yes mirroring was also an option. An FCI can leverage AlwaysOn Availability Groups to provide remote disaster recovery at the database level. 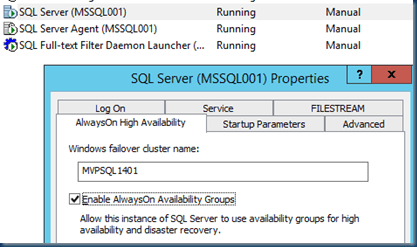 This is a AlwaysOn Failover Cluster Instances (SQL Server) FCI solution. When a SQL Server instance is configured to be an FCI (instead of a standalone instance), the high availability of that SQL Server instance is protected by the presence of redundant nodes in the FCI. Only one of the nodes in the FCI owns the Windows Server Failover Clustering resource group at a time. In case of a failure (hardware failures, operating system failures, application or service failures), or a planned upgrade, the resource group ownership is moved to another Windows Server Failover Clustering node. This process is transparent to the client or application connecting to SQL Server and this minimize the downtime the application or clients experience during a failure. This sounds great new options more but how to configure them and how about Azure In the next post I will show you how to create all this. 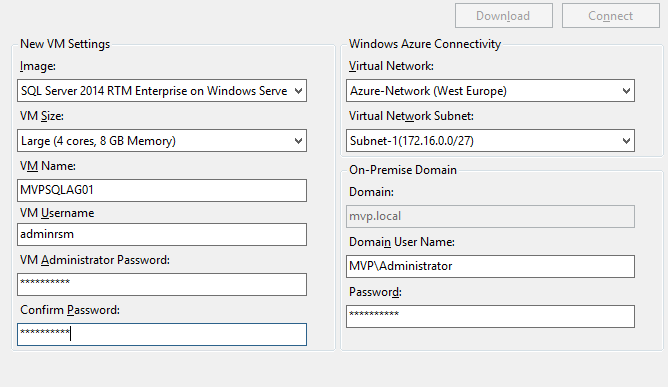 In the following I created a Cluster connected to azure with a Site to Site VPN. And will show you the HA options this will be in several steps else it would be a long post. But along the choices there are a lot of options that can be a problem with your configuration or maybe not the best option. And maybe you need a 3th party product the get the job done. Like Datakeeper my fellow Cluster MVP David Bermingham is SteelEye’s Director of Product Management. 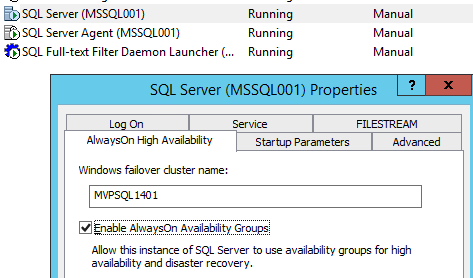 In the next part I will start with AlwaysOn Failover Cluster Instances (SQL Server) Followed By AlwaysOn availability group (SQL Server) and Azure Failovers. Eh in 15 minutes two full SQL nodes. just for fun. when I was building this lab and thought recording in one piece is no fun I can never use the items in one piece and the movie size is bigger. So I created every step in a single movie file, with sound and created one big movie with some speeding steps in it. So the OS installation the Windows version choice can be avoided by pre-staging the VM’s and I like to choose my disk size not very disk in my OS is the same. nor do I set a name ,IP and domain join the VM in one pass. I like to be flexible and do this step by step. and for demo’s is is nicer to show. 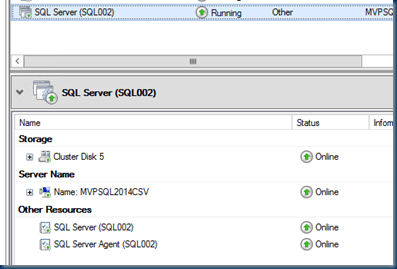 The SQL installation on CSV and adding the node to the normal SQL on disk took 7 minutes. The installation on the Disk was about 4 minutes slower. The scripts what I used are all available I already posted this on my blog. 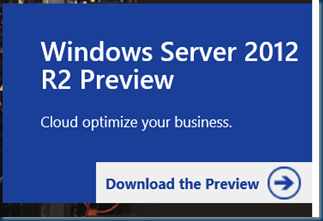 See my blog post on the SQL Server 2014 installation. Cluster Shared Volumes (CSVs) is a feature of Windows Server Failover Cluster. 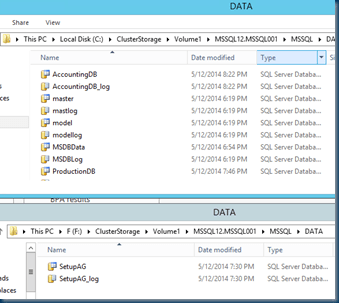 A CSV is a shared disk that is made accessible to all nodes in a Windows Server Failover Cluster. CSVs build a common global namespace across the cluster (accessible under the %SystemDrive%\ClusterStorage root directory). This allows creating as many shared volumes as desired in the shared storage, removing the 24 drive letter limitation. 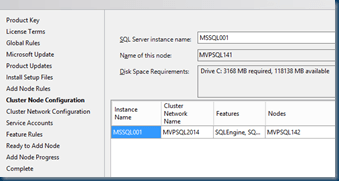 For SQL Server failover cluster instance FCI this means that you can create as many SQL Server failover cluster instance FCI as desired, without having to manage mount points. 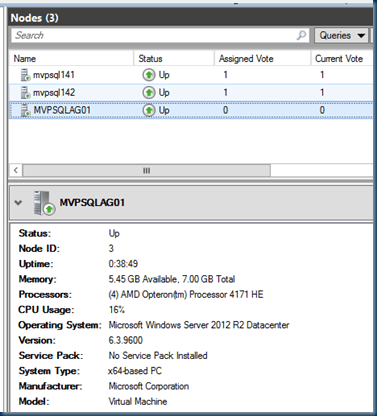 Cluster Shared Volumes (CSVs) is a feature of Windows Server Failover Cluster. A CSV is a shared disk that is made accessible to all nodes in a Windows Server Failover Cluster. CSVs build a common global namespace across the cluster (accessible under the %SystemDrive%\ClusterStorage root directory). This allows creating as many shared volumes as desired in the shared storage, removing the 24 drive letter limitation. For FCI this means that you can create as many FCIs as desired, without having to manage mount points. 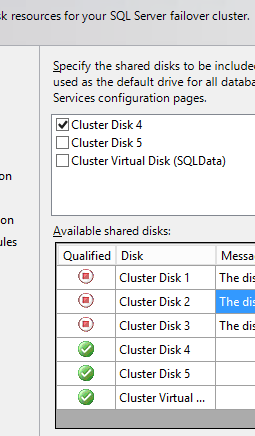 The cluster disk ‘Cluster Disk 4’ can not be used as a cluster disk. 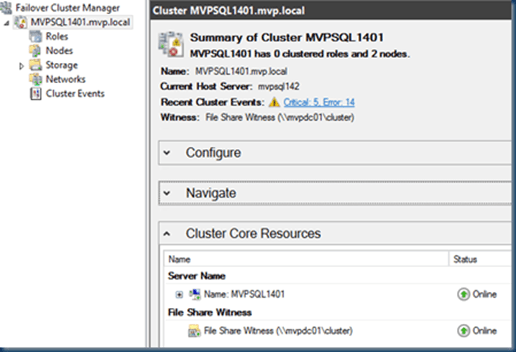 Analysis Services on WFC cluster cannot have files on Clustered Shared Volume (CSV) locations.